Ensaaf’s film The Last Killing directly counters Gill’s narrative and brings it to a wider audience. The Last Killing tells the story of police whistleblower Satwant Singh Manak’s struggle for justice for the survivors of ten victims of unlawful killings, who were tortured and executed by his Punjab Police colleagues in the early 1990s. Satinder Kaur, Ensaaf’s Multimedia Director, attended the ceremony to receive the award. “It’s an honor to receive this award and an even deeper privilege to represent the experiences of Manak and the surviving families through film. This award will shine another spotlight on human rights violations in India,” she said. Taking place at the new A+D Architecture and Design Museum, the NewFilmmakers LA Awards were hosted by Kate Flannery, best known for her role as Meredith Palmer on “The Office.” Alongside Kate Flannery, “Straight Outta Compton” actor Neil Brown Jr., “Scandal’s” Dan Bucatinsky, and “NYPD Blue” actress Sharon Lawrence presented at the award ceremony. Watch, too, our recent retrospective on human rights defender Jaswant Singh Khalra: A Light of Justice. Khalra’s work made the reality of enforced disappearances leading to secret cremations impossible to deny. Gill has consistently painted human rights defenders as terrorists and propagandists, led campaigns for police amnesty, and worked to cover up his responsibility for widespread and systematic disappearances, unlawful killings, and torture, as well as his order to murder Khalra. 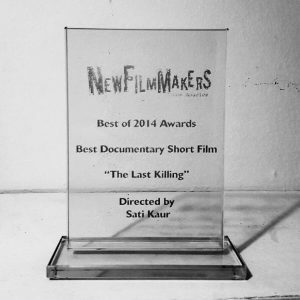 Help promote the truth about gross human rights violations in India by watching and sharing The Last Killing and A Light of Justice.